Buying a home means you make an instant switch from calling your landlord to becoming a landlord. If you live in that home, then the fixes can be done on your own schedule. If you’ve invested in a rental property, then you’ll need to make these fixes right away in order to support your tenants. In either scenario, it would be a good idea to know how to take care of these fixes because it will save you money from hiring a professional. Although it may seem complicated at first glance, the inside of a toilet is actually a rather simple universal system. A running toilet results from either a flush valve not closing or the water runoff not shutting down. You’ll know right away from looking on the inside of your tank, which is the problem. They are usually easy to fix with minor adjustments. All you need to do is turn off the water and make those fixes. If you need to replace parts, then you’ll find that most hardware stores will carry the parts that you need. 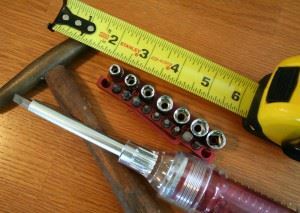 It might help to take apart the item and bring it into the hardware store for a perfect match. Television commercials advertising drain cleaners make unclogging a drain look simple. Unfortunately, many of those pricey chemicals could damage your pipes because of their corrosive nature. Instead, try a small plunger meant for a sink. You can also get a drain snake that you operate by hand. After you remove the clog, pour down a cup of baking soda and then 4 cups of boiling water to tear out the smell. You probably know how to set your thermostat but that doesn’t mean you’re setting it at the right temperature. The US Department of Energy recommends that you set your thermostat to 68° in the winter and 78° in the summer. This will result in optimal energy efficiency. Ideally, the temperature in your home should never drop below 55°. And raising the AC over 80° can create some problems with humidity. You want to keep your warm air and cool air inside. The first places that air escapes is through gaps in your window and doorframes. That’s why all of those areas should be weatherstripped. Depending on the set up installing weatherstripping is as easy as unfurling a roll of tape. Just take it time to make sure it is done properly. As for the bigger jobs like junk hauling, you definitely want to bring in the pros from Junk King Bucksmont to handle that. All it would take is one call to put a plan into action to have all your unwanted clutter gone for good. A junk removal session with Junk King BucksMont is what every homeowner can use. This entry was posted in BucksMont Junk removal and tagged homeowner, junk, rubbish on August 27, 2017 by Junk King. Last updated August 27, 2017 .